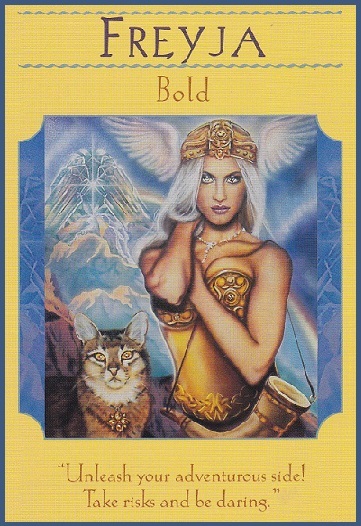 Kris Waldherr, in Goddess Inspiration Oracle Guide, refers to the Norse Goddess Freyja, as the Goddess of Beauty. She presided over the living and the dead. 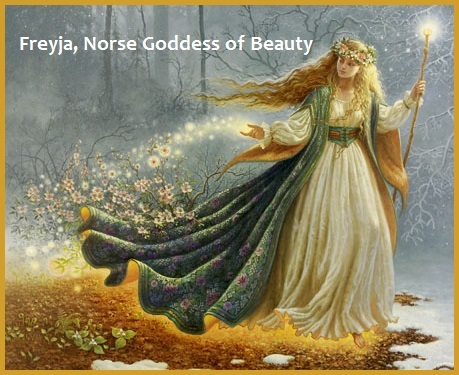 The author points out that Freyja’s story reminds us to acknowledge the healing power of beauty and love which are forces more powerful than war or death. Amy Zerner & Monte Farber, in Goddess Guide Me!, writes Freyja, is the Scandinavian and Germanic Goddess of Leadership. Today being Friday, the day named for Goddess Freyja, lets look at Freyja’s Ritual taken from Goddess Guide Me! 1. You may invoke Freyja’s leadership abilities by wearing a golden token. Choose a potent incense and light it. As it burns take a moment to center yourself. Breathe in the pungent odor five times as you watch the smoke rise. Gracious goddess, lead the way. Guide and council me today. and lead us proudly to our goal. 3. Fasten the yellow star to your bathroom mirror, where you will see it every day beside your image. 4. Look up at the stars and feel your Inner Goddess shine and know that you can think creatively, feel proud, and lead the way.